Properties in Occitanie average 4.6 out of 5 stars. Property 10: Mountain house with stunning views of the peaks. 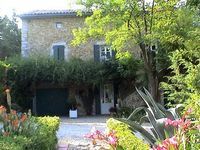 Property 11: Cevennes farmhouse of character with private pool, quality service. Property 30: Spacious, light and beautifully renovated. A home from home for the discerning. Property 38: Our vacation home is located on the promenade & on the beach of Gruissan. Property 42: Maisonette for 2 people with large private terrace and parking. Lovingly renovated Winner of "MAY THE BEST HOUSE WIN". Property 43: Lovingly renovated Winner of "MAY THE BEST HOUSE WIN". Property 46: Green Tourism in Cévennes': quiet, authenticity, sun, nature. The appartement is a good size, nice and clean. Owners are very friendly. You can walk to the to the Village and eat in nice restaurants. You can dit at the Pool or walk the river. We had a good holiday!